Doc here. 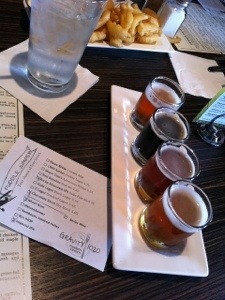 Enjoying a few flights with some fellow Aleheads in Fort Collins. So far we’ve sampled the suds at Fort Collins Brewery with an excellent Rye Imperial IPA, schwartzbier, Raucbier, red ale, cream ale, and just about anything else they set in front of us. Phenomenal Cuban sandwich too. We’re also spending quite a bit of time at Odell knocking back the Double Pilsner, St Lupulin Extra Pale, Myrcenary Double IPA, among others. 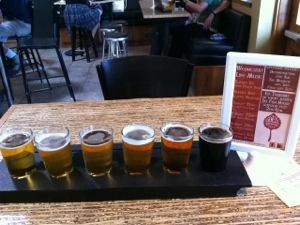 If if ever manage to get off the barstools we’ll make our way over to New Belgium for a scheduled tour. Stay tuned (and advance apologies for the typo ridden iPhone posts). Posted in Alehouses.Tagged Aleheads CO trip, Fort Collins. In terms of beer trips that I want to make, front range of the Rockies is my #1. Previous Post MENACE TO SOCIETY…OR BEER BUSINESS BRILLIANCE? ?